The Marvel Cinematic Universe is fairly self-contained. All you really need to enjoy it is what you see on the screen. But, as with everything that fans enjoy, we tend to want more. More backstory. More adventures with the characters we love. Just plain more. That's what THOR: THE DARK WORLD PRELUDE gives us. More. Like the other comics in the expansion of the Marvel Cinematic Universe, though, the question is, does it really give us more? Or does it just give us filler? Is it necessary? Or is it just a money grab? If you have seen THOR or THE AVENGERS, I could not spoil this comic for you. There are only two issues of this limited series, and this first issue starts right after the events in THOR and ends halfway through the events of THE AVENGERS. 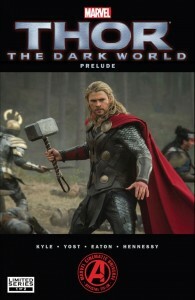 Truth be told, this comic is more of a prelude to THE AVENGERS than it is to THOR: THE DARK WORLD. We see that Thor's actions in his first movie have far reaching consequences — destroying the Bifrost, the rainbow bridge, has cut off Asgard from the other realms, meaning that the Asgardians are unable to help anyone. Without the Asgardians, evil forces are able to advance more boldly. We see that Jane Foster is not just sitting back, but working with SHIELD, and Thor is ever foremost on her mind. We see that Erik Selvig is having headaches. And then we see events from THE AVENGERS, before Thor gets involved, but all from the perspective of Asgard, reacting to the news that Loki is not dead, reacting to the activation of the Tesseract, and figuring out how best to act with the Bifrost gone. And this is really the core of this comic book. In THOR a very big deal is made out of the fact that the destruction of the Bifrost means Thor cannot return. But in THE AVENGERS Thor just shows up, like it's no big deal. THOR: THE DARK WORLD PRELUDE plugs this plot hole. We see that it is a very big deal. We see that the Bifrost is not the only way to move between realms, but it is by far the easiest. There is a cost to travel by this other means. What that cost is will probably be revealed in the next issue. 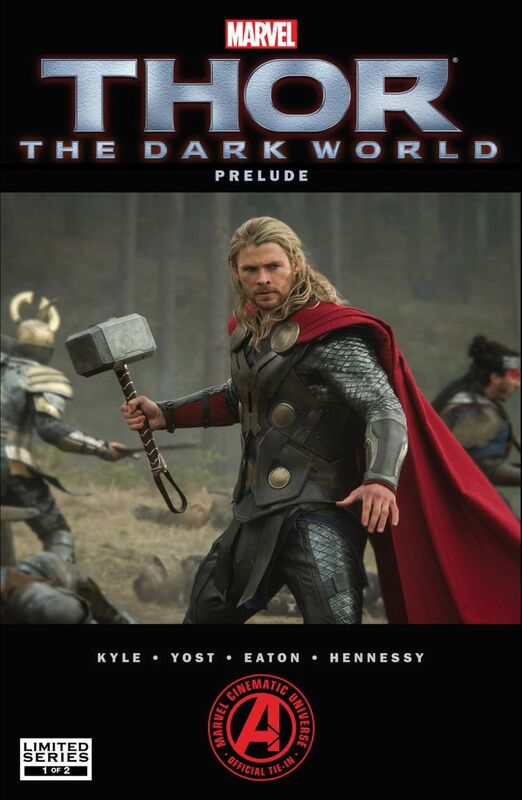 The artwork in THOR: THE DARK WORLD PRELUDE is solid. The characters, while drawn in a traditional comic book style, also retain much of the look of the actors who play these roles on the screen. This is a tricky feat for many movie tie-ins, but it works here. The story, though, is thin. This is probably due to the story this comic is trying to tell. We've seen this story before, and even the details we haven't seen on screen, it is not hard to fill in the gaps. The one exception is Odin's revelation that the Bifrost is not the only way to cross, but that hardly seems like the makings of two twenty page comics. All that said, there are some nice Easter egg type additions. The Badoon, enemies of the Guardians of the Galaxy are mentioned (and even shown for a panel), which causes me to wonder if this will be something seen in THOR: THE DARK WORLD or if it just a foreshadowing for GUARDIANS OF THE GALAXY. The Troll Lords and Frost Giants are mentioned on the same page, and I'm curious if that will figure in the THOR: THE DARK WORLD, too. And Coulson's appearance is to ask Jane Foster to relocate, perhaps to set up her situation in the next movie. Unfortunately, in making a story like this, serving to fill in the gaps of the movies we have seen and enjoyed, it almost serves more to remind us of those plotholes. The screen stories should stand on their own, and the comic stories should not exist to explain problems in the storytelling of the screen stories. This is recommended for completionists who simply must have everything to do with the Marvel Cinematic Universe (like, for example, me) or people who really want to know how Thor could just stroll to earth in THE AVENGERS. If this two issue series were a freebie with the DVD of THOR: THE DARK WORLD, I would probably have enjoyed it more. It may not be worth the cover price, but it if you find it somewhere or borrow it from a friend and are a fan of the movies, it's worth the twenty minutes it might take to read it. Also, Coulson is in one panel. It's good to see him, no doubt, and if he were still dead and not about to star in his own TV series it would have been a nice nostalgic moment. Instead I just wanted — you guessed it — more. Do you feel like this was written for kids who don’t read comics but like the movies or for comic faithful? Because it is so thin and sparse, it’s hard to tell. It bounces from scene to scene quickly, and I do feel that it is written more for comic readers in mind with how the storytelling plays out. But it’s not for the “comic faithful,” really. I don’t understand why people think Thor getting back to earth in the Avengers was a plot hole Loki asked Thor how much dark energy did Odin have to get Thor here. That was enough to tell me that there were other ways to go from Asgard to Earth and the term “Dark energy” implies that it wasn’t a good thing that they used. The problem is that such a big deal is made in THOR that once the bridge is gone, it’s next to impossible to do it. Then Thor just shows up and Loki drops a line to plug that little hole. The reason some people have a problem with it is that the cost is not seen on the screen. I do consider this a storytelling problem, really. And some of the comic feels like its the deleted scene that was cut from THE AVENGERS for time. Considering the emphasis on the difficulty, I went into THE AVENGERS expecting some time to spent on the problem.